I was there for the rock gig, as well as the HELP chicks. Yeah. 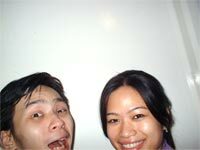 I wasn’t holding a digicam as professional as Joy‘s so I had to shoot from the top of my head. Literally. We sat too close to get a wide view, and by then, the auditorium was filled. Kevin of John’s Mistress said it was funny playing to a seated audience. As far as HELP celebrities go, there is the obligatory crazy off-center shot with Ayunami, the Linda Onn lookalike. Fazri and I took our time getting lost getting from Bandar Tun Razak STAR LRT to Aznin’s open house to One Utama and back to the LRT. I then headed to Le Bernardin for Shelley Leong‘s Songwriters Avenue. From left: Kevin, Zal and Khai (Justin Guber?) Here, Kevin was Broken Scar. I had never seen Zal alone on guitar; her voice was, well, excellent and was one of the reasons Cosmic Funk Express was deserving of that spot in Rock The World 5. Khai sang his Ballad Of Justin Guber, and it explained just who Justin was. 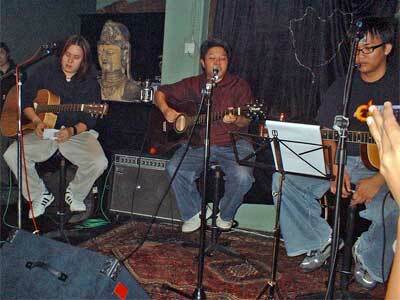 Zal finished with an invitation to jam in the key of E. Khai’s rock solo on an acoustic was cool. The songwriters played in round-robin fashion, meaning they took turns to play one song each. From left, going downwards: Max and some dude, some dude, some dude, some dude, some dude, Ahmad the dude, Jerral the Shelley guitarist dude, the dude who I bump into often and the organizer herself, and Shelley with the beautiful guitar one could win from buying her CD. Imagine! The fretboard could extend till the bridge since there was no soundhole below the strings! Once you’ve sat down, you wouldn’t want to get up. 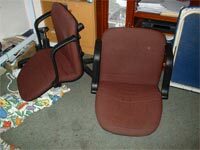 Due to the lack of chairs, we had to pack off some stuff staff. We then headed to Great Eastern Mall. So much for greatness; I hadn’t seen such a small shopping mall in a long time. It was even smaller than say Ampang Park, supposedly one of the first shopping malls to have been built in Malaysia. At Alexis Bar, Tracy was already sitting in her reserved table, and most tables were reserved so YK and I went up to Chicken Rice Shop to have dinner. We knew 9pm was late, as the lights were off already! As we walked away from the counter, the electricity came back on. By the time we got back to Alexis for Pete Teo‘s songwriter’s round, Alda and Debbie had to sit on bar stools! For most of us rockers, it was awkward to be in such a classy place. Again, it was in round-robin fashion. 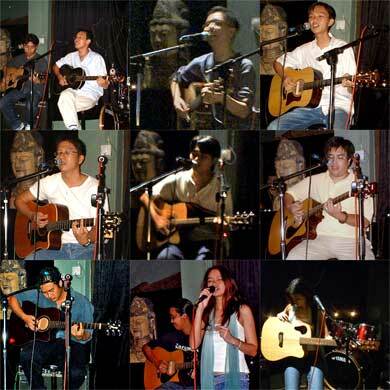 Az added comic effort in songs like “Lagu Royalti Belum Datang“, ending his song with “oh there’s the postman!” I bought his Acoustic Gestures album that night. Look for me in the credits! Eugene Ng reminded me of John Mayer somewhat as the girls fell for him. 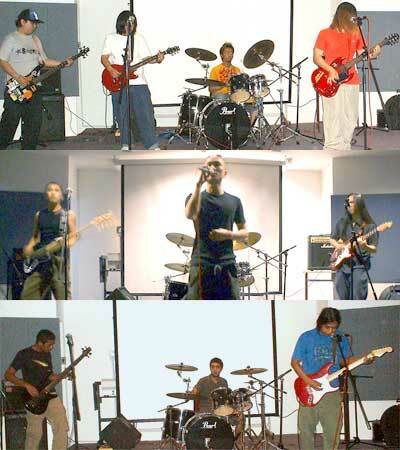 Mukhlis crooned and played lead fills on guitar, with Roslan as merely a rhythm guitarist. That’s all, folks. May your connection be fast and consistent. This entry was posted in Music, Pictures, Travelling on December 2, 2004 by 2konbla. gheez…..why everytime you get to go this kinda stuff one arh? Yes I get edgy when I see typos esp. on blogs like yours. Oh, just a note on prev. typos on &quot;Sagittarius&quot; and &quot;Saggitarians&quot;. I fixed both; I didn’t know Sagittarius was one ‘G’, two ‘T’s! I blame Anthony Kiedis for singing it like ‘didgeridgoo’. Red Hot Chili Peppers – Walkabout is the only song I’ve heard the word in.